This is a crucial time for Fiji to shape the future of the nation, especially after the elections. SODELPA, including all political parties, should act like mature and responsible forces. They should not look at the Indo-Fijian population and India through same prism, India is a neutral country and addressing joint parliament session is a common practice. Country heads address joint parliament sessions of other countries. Mr Modi as well as other Prime Minsters did this several times in the past. In fact Fiji should take maximum benefit from India and China which are the biggest emerging economies. These countries can play a major role in overall development of Fiji. Political parties should keep their local ethnic issues aside because if something constructive comes out of co-operation between the two countries (India and Fiji) it will be beneficial for every Fijian. So far Indians have high regards for every Fijian. This may be because of presence of ethnic Indian population, no one in India knows about ethnic differences here. For example I can relate more with my iTaukei Fijian friends compared to anyone else in Suva. Fiji is a good tourist destination for Asians. In fact both India and China are biggest emerging economies and both are short of energy resources locally, both countries import over 70-80 per cent of oil from other countries. The prime requirement of both the countries is to secure oil routes and explore new oil fields. This is where Fiji comes into the picture. China’s disputes with neighbours in East and South China Sea are known in this regard, India is helping Vietnam to counter China in the Asia-Pacific region and India’s ONGC Overseas Ltd. is exploring new oil blocks with Vietnam despite Chinese warnings. The presence of Indian and Chinese navy ships in the region is a known fact. China’s 80 per cent oil comes through Indian Ocean where Indian Navy has an upper hand with two aircraft carriers but China is fast making its presence in the region with the development of Gwadar Port in Pakistan, Habantota in Sri Lanka and installing radar facilities in Coco Island of Myanmar. India is also trying to counter China by developing a crucial port in Iran, by making strong presence in Afghanistan, improving strategic relations with Taiwan, Japan and Vietnam. Both Asian giants are in competition with each other in Africa for oil and mineral resources. China is building metro line and working on various infrastructure projects under “Oil for Infrastructure” scheme in Nigeria. India setting up number of industries and hospitals in Nigeria and imports eight per cent of oil of its total requirement from Nigeria. Both India and China are proactive in other countries of West and East Africa as well. The Asia-Pacific region is another area where the two Asians economies are sitting with tele-lenses. Fiji is focal point for 12-13 island countries in this part of the world. Now it becomes the duty of Fijian leaders to calculate maths in favour or their country. They shouldn’t show extra proximity or distance from either of the two. 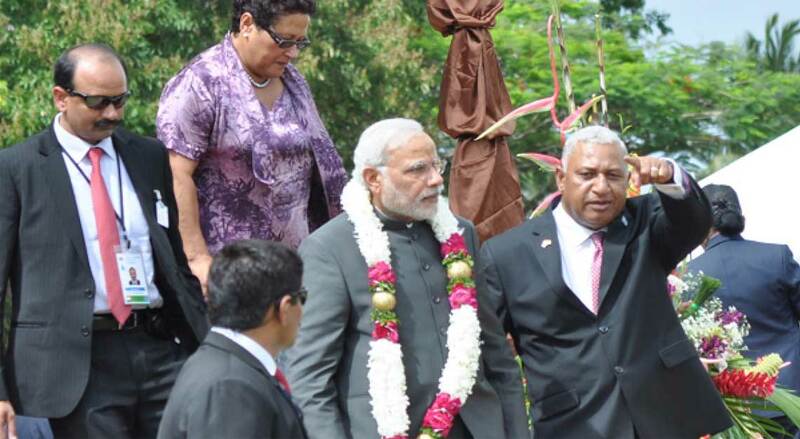 Both India and China can offer great opportunities for Fijians. China with a fatter wallet can invest in various infrastructure projects in Fiji. Tourists from China can increase revenue manifold till they start exploring other parts of the world. It will be great for the country if China transfers affordable technology for local manufacturing. Although it’s a great challenge for Fijians to settle in China for better education and skill development, China prefers export of its low- cost products rather than setting up industries locally or capacity building of locals. India on the other hand prefers to set-up industries in other countries and is comparatively less hesitant in technology transfers. Skill development is one area where India can play a bigger role for Fijians. Fiji can have a great yield if India can help in development of software industry in the country with the help of close to a million English- speaking population of Fiji. Road building in the interior parts of the country and setting up technology institutions could be other expectations from India. There are cultural and ethnic issues in almost every country but these should not come in the way of overall development. It’s time for Fijians to push aside internal issues. They should realise heads of India and China are not here for their love for any ethnic group; their goal is bigger and in the interest of their own country. Fijian leaders should also understand this and try to gain maximum for the country by inviting more and more investment and benefits for Fijians. Showing distance or proximity to either of these is not in the interest of Fiji. With wise diplomacy, Fiji should become the regional leader and emerge as the most flourishing economy in the Pacific Islands.